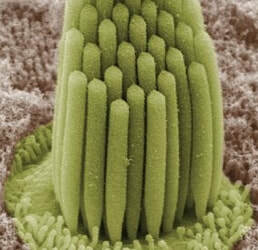 Stereocilia cells in the inner ear. Use hearing protection to preserve them! The Magnetophone, an early tape recorder made in the 1930s. Workstation ergonomics. Be aware of your posture and habits. Consult a variety of sources and use common sense. Consider studying the Alexander Technique if you can find the right teacher. 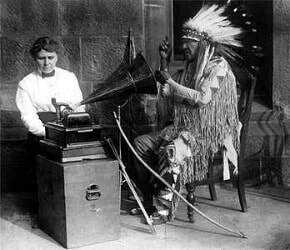 Speeches by public figures can be good sources of public domain recordings. John Glenn, while an astronaut and U.S. Marine would have been speaking in an official capacity, so his speech in NYC was part of one of these jobs as a federal employee and the text would be in the public domain. If the recording was made by NASA or another government agency, that recording would also have been born in the public domain; that is, copyright-free. If a recording is made by a radio or television network, you may need to contact that network in order to get permission to incorporate it in your own projects. Røde Soundbooth microphone demonstration and YouTube channel. The recording of Secretary of State Bainbridge Colby was one of 59 sound recordings of national and world leaders made by Guy Golterman between 1918-1922 with early Columbia Gramophone equipment. While you may not be able to use EQ to turn a bad sound into a great one, you can make a silk purse out of a sow's ear. Extended version of Video Example 5-16 on setting the cutoff frequency of a high-pass filter, with the complete song "That's How It Goes" written and performed by Robert Willey. Gregorian Chant is associated with reverberant spaces. Daniel Kish is blind. Hear about how he can ride a bicycle using echo location. Acoustic treatment materials made by Auralex, Real Traps, and sE Electronics. In 1878 Eadweard Muybridge took a series of photographs at Leland Stanford's Palo Alto Stock Farm as an experiment in order to determine whether a galloping horse ever lifts all four hooves off the ground at the same time. He then copied the images for a machine he invited called a zoopraxiscope, a type of early movie projector. The farm later became the campus of Stanford University, where John Chowning (with the help of Max Mathews) set up the first university computer music lab just a few miles away in 1964. Introduction to Digital Audio: analog-to-digital conversion (aka samplng) and binary number system. Audacity - free recording and editing program for Windows, OSX, and Linux. To use it for MP3 encoding you will need to download and install the LAME MP3 library. Converting file formats with iTunes. The Truth About Digital Latency, from PreSonus. Speech Jammer - a delay of a few hundred milliseconds can make it difficult to talk.